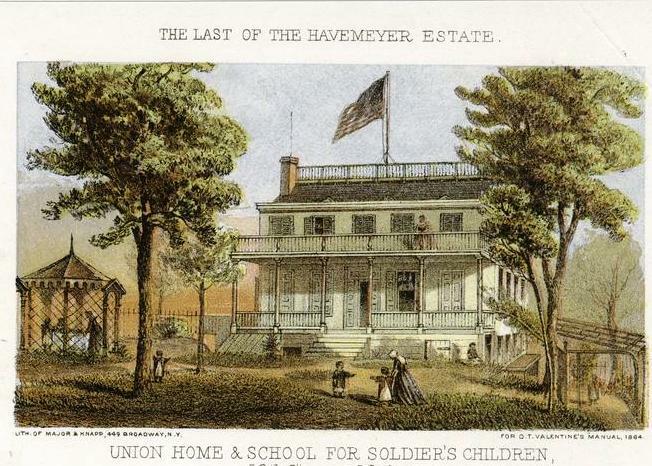 In 1864 Valentine's Manual noted that the Union Home was "The Last of the Havemeyer Estate." The lithograph gave a rear view of the mansion that cut into the hillside. Like other prestigious New York families in the 18th century, the Havemeyers owned an impressive summer estate north of the city. Having amassed a fortune in the sugar refining industry, they ranked among the city's wealthiest. The mansion sat on a low rise and was meant to impress. Seen from the front, the masonry home rose three floors over a fieldstone basement. High wooden verandas caught the summer breezes and tall windows that touched the floors provided optimum ventilation. An elegant balustrade finished the hipped roof. The house nestled up against a knoll, so that what was the first floor to the front was below ground level to the rear in the service area. It would have provided easy access for kitchen staff to root cellars and other cool, subterranean rooms. The elegant era of country seats in New York City was not to last forever and by the middle of the 19th century the streets and avenues of what would become Midtown were already in place. The grand mansions where the city’s elite entertained in high style were gradually transformed into roadside inns, hotels or simply razed for development. The fate of what was now referred to as “the old Havemeyer House” took a turn on April 12, 1861 when Confederate forces fired on Fort Sumter. The North and the South were now at war. Within a month the wife of Major Robert Anderson, who was in command of the Charleston garrison, arrived in New York. Mrs. Anderson already foresaw the carnage of battle to come and the resulting fatherless children. She proposed the formation of an organization to care for and support the children of volunteer soldiers who would die in battle. Slightly north of the Havemeyer mansion was the former country estate of Peletiah Perit, Esquire at the corner of 75th Street and 11th Avenue on the banks of the Hudson River. The group leased the house and grounds on August 1 and opened the school. Before long there were 80 children attending classes. Some regiments pooled resources for the support of the family of a fallen member. When a soldier under the command of Colonel D’Utassy was killed, his two children were left in the care of the Home. When word of this came to the colonel he started a fund among the other officers, providing a subscription of $10 a month himself. The total amounted to $816 per year for the support of the orphans. Tragedy soon struck however. A child was admitted to the home who carried “that terrible scourge, scarlet fever,” as it was described by the managers. Quickly, 30 children contracted the disease and the panicked women sought help from Dr. Walter Kidder to stem the progression. By January 1862, Secretary Olive M. Devoe wrote “We regret to say death has been among us, three children having left us, as we trust, for a better ‘Home’ above.” Among the four children who succumbed, in addition to little Allicia Brooks, James Lawton, and Rachael Mclean, was Mrs. Devoe’s only son, Frank Robinson Devoe, just five and a half years old. The Union Home experienced a shock and near set-back when the Advisory Committee disbanded itself and ordered the organization discontinued. The men wrote that “having ascertained that the said officers and managers have no legal existence as an incorporated society or association, yet approving of the object contemplated by them, do hereby advise that the said officers and managers suspend of discontinue their operations under their present organization.” The committee advised that the Union Home seek incorporation as quickly as possible. The ladies of the Home did just that. And on April 22, 1862 an act was passed incorporating the group with the still-ungainly name “The Union Home and School, for the Education and Maintenance of our Volunteer’s Children, Who May be left Unprovided For.” With the new incorporation, they took a three-year least on the Havemeyer estate to the south at 58th Street, just west of 8th Avenue. The converted mansion is seen here from the front. The mansion was outfitted to house and school scores of young children and the side wall was converted to a sort of billboard, advertising the Home. But despite its spaciousness, the home would be sorely taxed by the number of orphans pouring in. On January 1, 1863 the home had received 122 children between 18 months and 13 years during its three year existence. By June there would be 175 children living in the house with applications pending for 100 more. The Union House needed more money. The children lucky enough to be admitted were educated in every functional aspect of making one’s way through life. In 1864 J. Henry Hayward described the Home’s environment. The need for additional funds was understandable. In October of that year the Union Home was now providing for 500 children. A fair was held that month at Irving Hall to raise funds. The Times opined that “It would be a reproach to the patriotism and benevolence of New-York if this truly worthy enterprise should fail for want of the cooperation of her liberal citizens.” The fair was visited by high level military personnel, such as Major-General Banks and Brigadier General Cochrane, who made speeches in support. The newspaper did its best to promote the event. It was a personal visit from General Ulysses S. Grant in 1868, however, that did the most to boast the prestige of the institution. 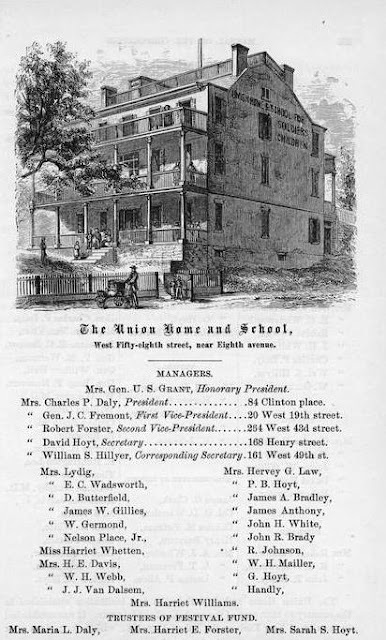 Following the tour of the school and home, the Union Home and School incorporated the general’s likeness into its letterhead in hopes of inducing donations from wealthy contributors. The young boys put on a military display for the general who praised the order and precision of their exercises and made special note of their 16-year old captain, Thomas Davis. By now the war had been over for five years. One by one the children became “of age” and left until the purpose of the Union Home and School for Soldiers’ Children was no more. Eventually the home was closed and the Havemeyer mansion, its lawns and gardens now cramped with rows of buildings, was razed. Today West 57th Street is a congested six-lane crosstown thoroughfare lined with soaring glass and steel skyscrapers. And the elegant 18th century home, once the refuge of hundreds of children otherwise lost to America’s darkest hour, is wholly forgotten.